Japan has had deflation (negative inflation) for over half the time since 1990. Japan’s nominal GDP in 2016 was at the same level it was in 1997. Japan’s debt-to-GDP ratio currently stands at over 240% and a fall in the birth rate means the population is falling. Europe has had similar issues. Greece has a debt-to-GDP ratio of over 180%, Spain had deflation from 2014 and 2016 and Italy has returned to negative growth rates after having experienced if from 2008 to 2014. 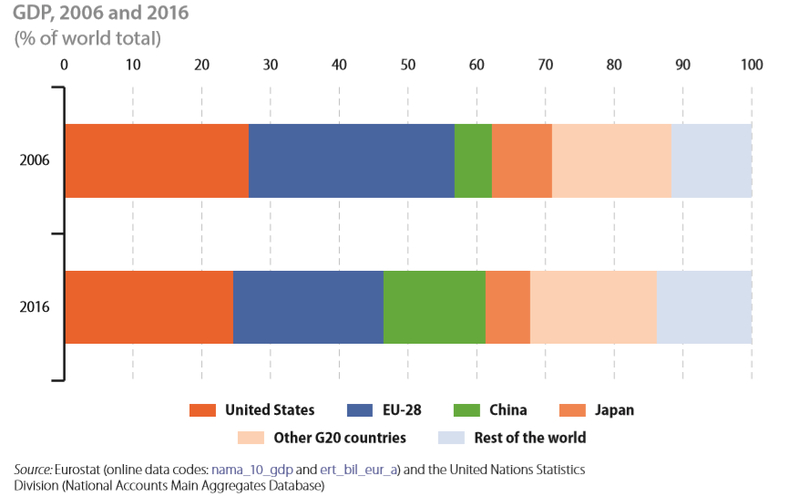 The European Union’s share of global GDP fell from 30% in 2006 to 22% in 2016. 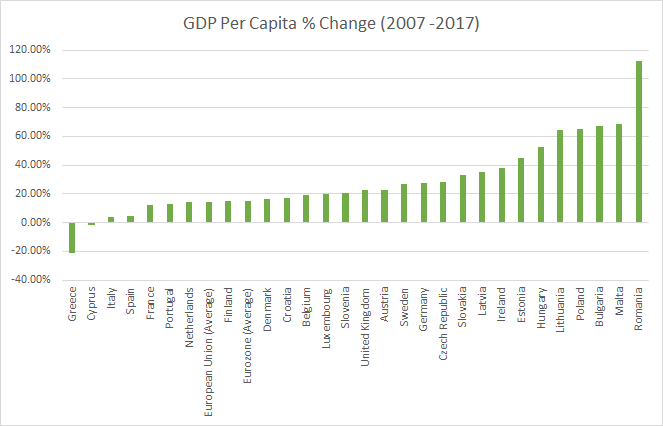 Parts of the EU have seen GDP per capita shrink and the overall compounded annual growth rate was just 1.2% between 2007 and 2017. GDP growth adjusted for inflation was negative. (Read More: Parts of the European Union have seen nominal GDP per capita fall between 2007 and 2017). Japan’s share of global GDP on the other hand has fallen from 20% in the early 1990s to 10% in 2006 to 5.5% in 2016. Japan’s inflation rate has not reached the Bank of Japan’s target of 2% since 1993 (other than in 2014 due to a one-time sales tax hike). The Eurozone and European Union have avoided deflationary territory but just – they have come close to negative inflation several times. Japan’s birth rate has been falling since 1995. 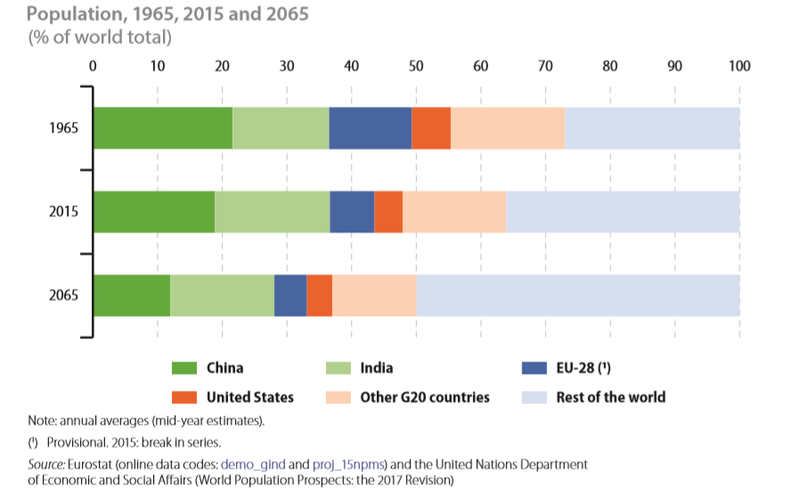 The European Union’s population is set to fall in the next five decades and its share of the world’s population is projected to fall from 6.9% in 2015 to 5.0% by 2065. 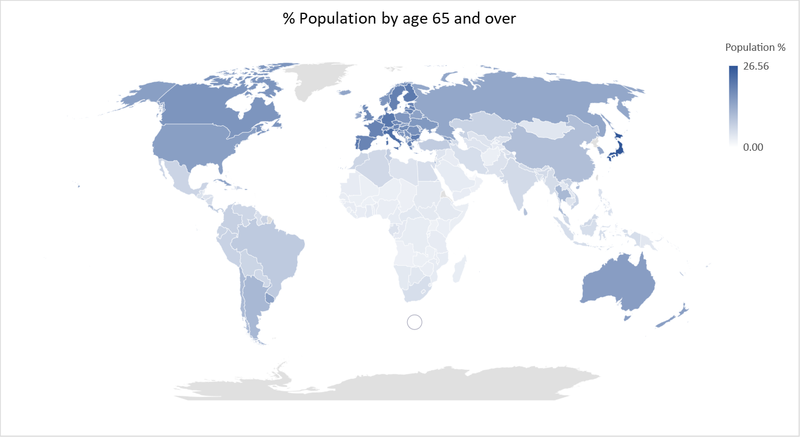 While Japan has the world’s oldest population, the working age population in the Eurozone (and the European Union minus the United Kingdom) started to shrink in 2009. Japan has a negative interest rate of -0.10%. In Europe, Switzerland (-0.75%) , Denmark (-0.65%) and Sweden (-0.25%) have negative interest rates. 20 other European countries (Austria, Belgium, Bulgaria, Cyprus, Estonia, Finland, France, Germany, Greece, Ireland, Italy, Latvia, Lithuania, Luxembourg, Malta, Netherlands, Portugal, Slovakia, Slovenia, Spain) have an interest rate of 0%. The European Central Bank says interest rates would remain at record lows until the end of the 2019. 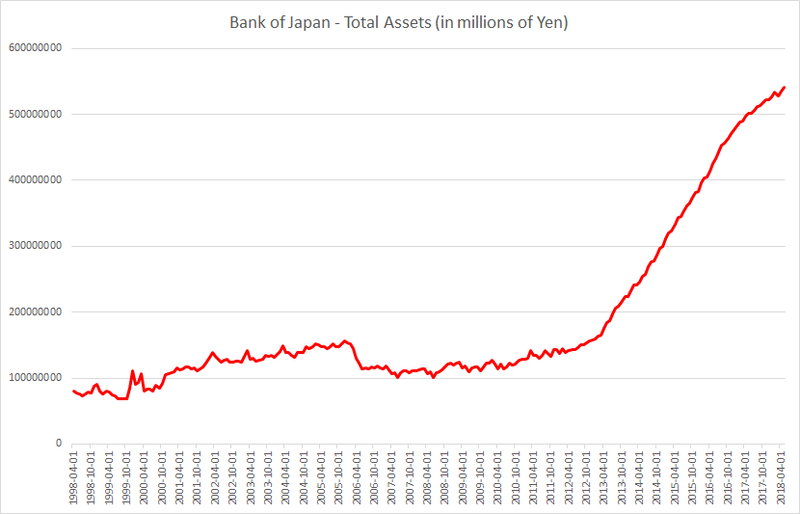 The Bank of Japan’s balance sheet is over 100% the size of Japan’s GDP. The Bank of Japan has a target to buy 6 trillion Yen ($54 billion) worth of exchange traded funds a year. It now holds almost 82% of all ETFs in Japan and is indirectly the largest shareholder in many large Japanese companies, almost about half of listed companies in Japan. The European Central Bank balance sheet has increased by 2 trillion Euros since 2015 when it announced its bond buying programme. The European Central Bank (ECB) only started its Quantitative Easing (or QE) program in March 2015 in order to fight ultralow inflation in the Eurozone (also called the Euro Area). It somewhat worked by weakening the Euro (€), increasing exports, giving the stock market a boost and drastically lowering financing costs for European governments and corporations. 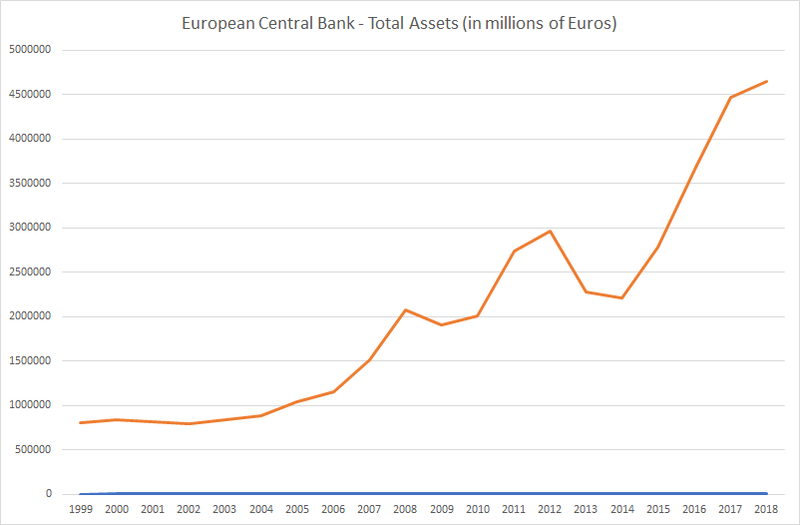 This caused the ECB balance sheet to soar over €4.5 trillion or 45% of Eurozone GDP. Even though the ECB ending its bond buying program in 2018, the ECB recently announced a new series of quarterly targeted longer-term refinancing operations (TLTRO-III) will be launched, starting in September 2019 and ending in March 2021, each with a maturity of two years. These new operations will help to preserve favourable bank lending conditions and the smooth transmission of monetary policy. Under TLTRO-III, counterparties will be entitled to borrow up to 30% of the stock of eligible loans as at 28 February 2019 at a rate indexed to the interest rate on the main refinancing operations over the life of each operation. Targeted longer-term refinancing operations (TLTROs) are one of the ECB’s non-standard monetary policy tools. Through TLTROs, the ECB provides long-term loans to banks and offers them an incentive to increase their lending to businesses and consumers in the Eurozone. The first TLTRO series was launched in 2014. The second one, introduced in March 2016, was called TLTRO-II. 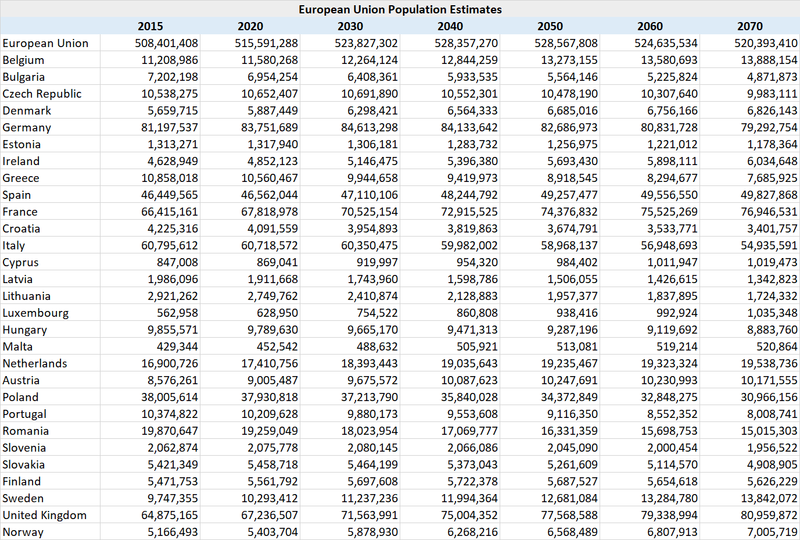 Conclusion: Europe is not the next Japan yet, but is getting there. Japan has outperformed the world in terms of life expectancy and quality of life – characteristics Europe would like to replicate. Previous PostPrevious How big really is the total debt of the United States?